The Morris Water Maze (MWM) test measures the ability of rodents to learn and remember the spatial location of visual cues in a room. 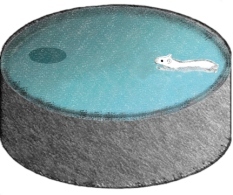 This test involves placing the rodent in a pool of water where it must use visual cues to remember the location of a hidden platform just below the water’s surface. Probe trials (transfer tests) are also used to assess the rodent’s ability to retrieve information learned in previous hidden platform tests. The MWM test measures spatial learning and memory. This is one of the most popular tasks in behavioral neuroscience and is sensitive to both the amnestic and memory-enhancing effects of drugs, as well as gene manipulation dependent on intact hippocampal function.